In this post, I talked about why I like to give toys to my workshop participants to play with. Today, I'm going to talk about how I use toys and props myself to make workshops more fun and engaging. 1. Cow moo toy. Flip the can over and it makes a mooing sound. A little surprising at first. 2. Tiny maracas. Shake shake shake! Gets their attention every time! 3. Stuffed toy American Goldfinch. This birdy makes an authentic American Goldfinch bird call to get the audience back on track. 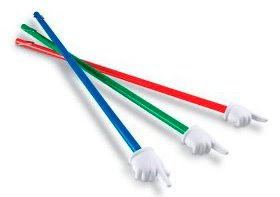 When I bought these two-foot-long hand pointers (thanks to Andrew Dlugan for first *pointing* them out), I wasn't even sure what I would do with them. The first time I took one to a training, the group was sitting around a large table and people couldn't reach some of the materials in the middle. So it was fun to pull out my hand pointer and use it to push papers to the people who couldn't reach them. I also have a giant pen that I keep tucked away until someone needs to borrow a pen, or until I pass around my newsletter signup sheet. What's the point of the toys and props? Fun! Just because we're talking about serious or important matters doesn't mean we can't enjoy ourselves a little... or a lot. Laughter is the best way to warm up an audience. Toys that make sounds, are extra large or extra tiny, or are colorful and playful in some way, will all work to wake up and engage your audience. And remember: keep your prop hidden until you're ready to use it. It's much funnier when the audience is surprised. You don't have to go crazy with tons of toys. Just bring one or two and see how it goes. Be subtle or be silly. Try it! You have the most incredible ideas! My favorite (and it got great feedback), was a little routine in my training where I used props to illustrate (in a funny way) a story I told. It was about the ups and downs of sales, and I used a toy phone when talking about calling people, I use certain candy bars for key words and descriptions (and those were thrown out to the audience as I moved on). Some examples are oversized phones, toy cars, almond JOY, men are from MARS, NOW and LATER, HUNDRED GRAND, NERDS...and on and on. All of my props were hidden, so it kept the crowd guessing, and they had lot's of fun. It would last about 10 minutes - made a great opening (attention getter) or closing (bring it all together in a memorable way). It required a lot of prep to keep it moving fast...it wasn't a slow boring story, it moved fast and had a lot of energy. If someone else has done the same, I would like to hear about it! I love the idea of using an oversized pen to have people sign up! It seems to me like you would get better participation just because of the "novelty" and fun of using a "special" pen! I will certainly use that in the future. Thanks! "Their current top 50 list includes a yodeling pickle, and both inflatable toast and inflatable fruitcake. http://www.mcphee.com/categories/top50.html"
Haha, who would have thought that bacon would be so popular...??? And you just can't beat the "Santa Dreidel"! Thanks for sharing, Brandon! Your story sounds fun. Richard, I was just on Archie McFee's site yesterday! They have some great stuff. I'll have to bookmark it. Another tip I thought of is that if you're too close to your work to figure out a good tie-in, just ask a friend, family member or fan. Sometimes 2 heads are better than one. Great idea, Cheryl. I actually get a lot of good ideas from my husband, when I'm blocked and can't think of a good activity or toy. Authors doing readings could really run with this, couldn't they? Wonderful post, Lisa! This is something I've advocated for years with my clients -- props of all kinds. The reason is that you put people in a room with no windows, white noise from the a/c system, turn the lights down and put up Power Point slides, and you've got a sensory deprivation chamber. Give people something to hold and they'll wake up and get energized! Thanks, Nick. There are a lot of distractions audiences are dealing with during a presentation, including what's going on in their own heads. Why not introduce a distraction that actually helps them learn? It's fantastic to see you found a great use for those two-foot-long hand pointers, Lisa. I'd like to take one of your courses. It sounds like lots of laughs. Great idea! Everyone says to use humor in your speeches, but this goes beyond lame jokes off the internet. I'll be recommending this! Andrew, if you ever make it down to my neck of the woods, you're invited!